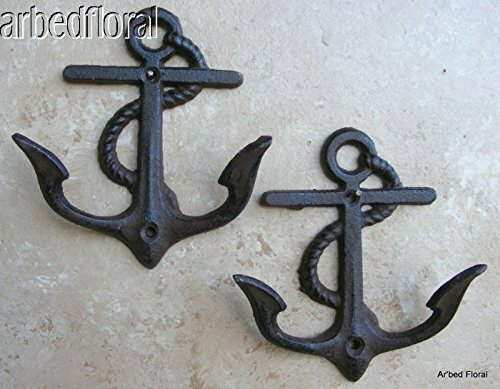 Set/2 Cast Iron Nautical Anchor Hook Rustic Brown 5 1/4 inch tall by mds at Delta Everett. MPN: 43160-125111. Hurry! Limited time offer. Offer valid only while supplies last. Sold as a set of two each. Excellent nautical decor for your home or office. Made of solid cast iron and coated with an old timely rust look finish. Sold as a set of two each. Excellent nautical decor for your home or office. Made of solid cast iron and coated with an old timely rust look finish. It measures 5 1/4 inch tall x 4 1/8 inch wide and weighs about 8 ounce. It sticks out from the wall about 3/4 inch. It may look flat in the picture but it is not. Has one precast screw hole for easy hanging.